After a research trip to the USA, the coffee aficionados at That Cold Stuff were exposed to the vast ranges of both coffee and beer varieties available Stateside. On return, the owners wanted to trial some of the ideas they developed while travelling and approached Bootleg Brewery to do just that. 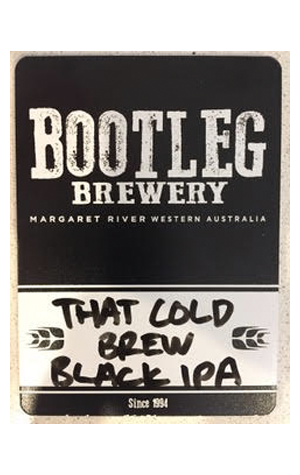 The style the collaborators landed on, a black IPA, was ultimately chosen so the citrus flavours of Citra and Amarillo hops could pair with coffee’s lighter, fruitier notes, while still allowing the roasted elements of both beer and cold brew to work together. Unsurprisingly, the resulting beer’s most obvious aromas is coffee, supported by some chocolate and toasty characters. But some orange citrus notes are also present in That Cold Brew, as are hints of caramel and berry, quite likely off the back of the coffee maker's slowly prepared cold brew.